I just wanted to let you all know that we've made the first version of the books available (version 0). 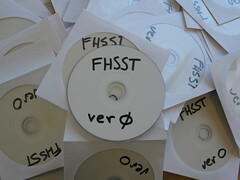 The homepage (http://www.fhsst.org) has links to the pdf files for the books. We're looking to get comments/suggestions/corrections over the next two months and produce an even better version in time for the 2009 school year. To ensure that as many people as possible have input, please help us by spreading the word to anyone who may be interested in using the books. We are humbled by the efforts and generosity of the volunteers who have given of their time to work together to produce a resource that educators and learners alike may use as best suits their needs. Thank you all for your tremendous work! The books do not represent the final word but rather a starting point; our open licence allows everyone and anyone to use these free books as textbooks, reference books, additional reading, or break them up however they see fit. Our hope is to see educators work together to customise and improve them for their own needs. We will continue to develop the books incorporating any suggestions, feedback or material donated to FHSST, but would also like to encourage groups of educators to adapt them collaboratively to be the books that suit them best. Mark on behalf of the core team.